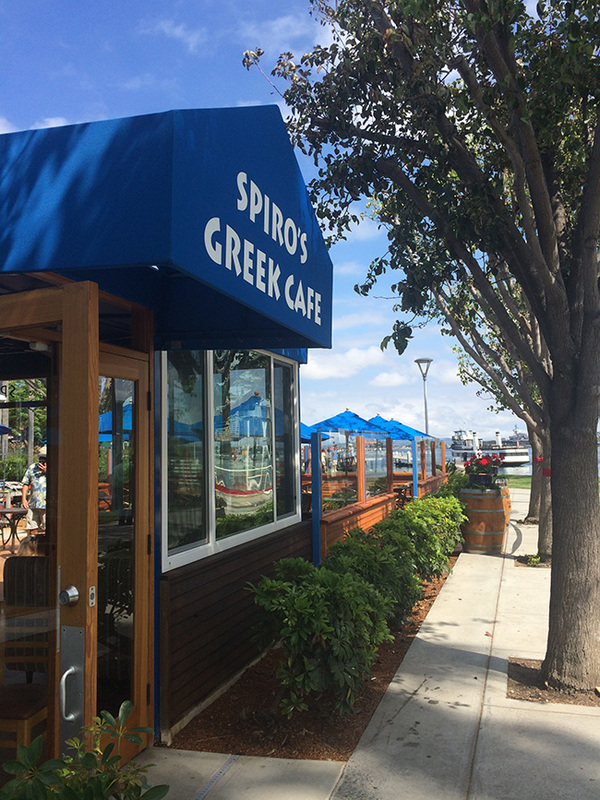 When owners Spiro and Nancy Chaconas opened Spiro’s Greek Café in 1995 at the Coronado Ferry Landing, they wanted to create a family atmosphere that celebrated the flavorful food of Spiro’s homeland, Corfu, Greece. Now, 20 years later, after closing for three months while the restaurant underwent a complete overhaul, they’ve reopened with the same intention, but with a bigger kitchen and menu to serve their patrons. The restaurant has also introduced a new name, Spiro’s Greek Café, that reflects the restaurant’s wide array of Greek specialty dishes, in addition to its popular gyros. The melt-in-your-mouth spanakopita and delectable baklava are still on the menu, which also includes pita sandwiches, French fries, soups and salads. Spiro’s favorite parts of the remodel are the new entryway, which was opened up to include a bar with a bright skylight overhead. 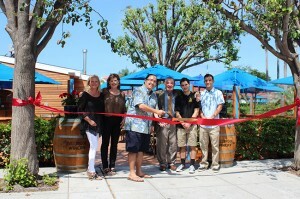 The restaurant features Coronado Brewing Company beers on tap and serves Fallbrook Winery wines. The interior enclosed patio area now features increased seating, including comfortable new banquettes, and new furniture on the outside patio as well, where diners can catch fantastic views of the San Diego Bay and downtown skyline. The indoor patio’s overhead flat-screen television is part of the Chaconas’ plan to offer Monday night specials on food and drink during football season. And, on Saturday nights, in keeping with its family-friendly vibe, the restaurant will serve family-style dinners with menu items such as rack of lamb and prime rib. The restaurant’s happy hour Monday through Thursday from 3 to 5 p.m., features $2 off appetizers and $2 off beer and wine. The Chaconases live in Coronado where they have generously given to charities throughout the city. Both Nancy and Spiro have been avid supporters of the Coronado Schools foundation, with Spiro serving as a past president of the Foundation. A member of Rotary Club of Coronado, Spiro was also named Citizen of the Year in 2013 by Coronado Private Bank. 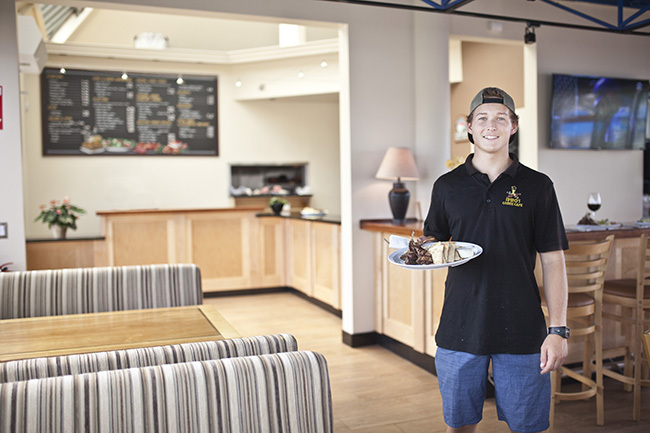 Spiro’s Greek Café is a new and improved space, but the foundation of the restaurant remains the same: “Through both the menu offerings and the new atmosphere, we are a family restaurant that caters mostly to our locals. 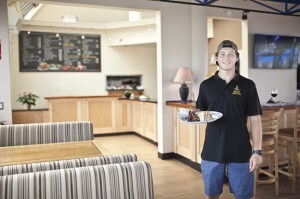 We want to serve the patrons who have been so loyal to us,” said Spiro. Coronado Ferry Landing, 1201 First St. Hours: Sun.-Thurs., 11 a.m.–8 p.m., Fri. & Sat. 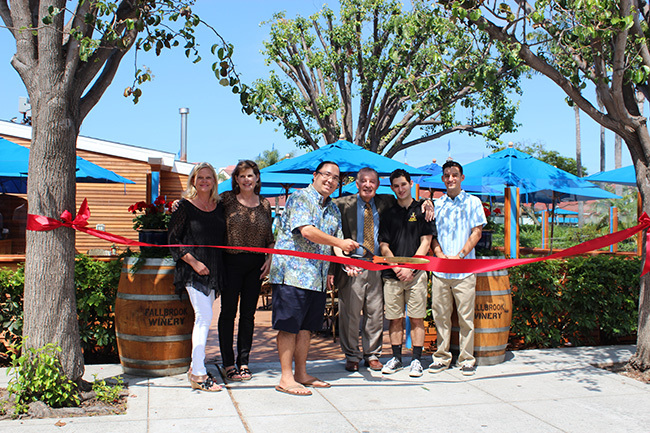 Mayor Casey Tanaka cut the ribbon at the Spiro’s Greek Cafe grand re-opening ceremony on July 22, following a three-month remodel. Pictured from left: Robyn Gray, Nancy Chaconas, Casey Tanaka, Spiro Chaconas, Michael Chaconas and Demetri Chaconas.